Maurice Karkoff had a solid education (by Lars-Erik Larsson, Karl-Birger Blomdahl, Vagn Holmboe among others) and with a confidence he composed in a variety of genres. In recognition of his musical ability, he was conferred several awards, including the Swedish Radio Symphony Orchestra's Prize and the Large Christ Johnson Prize. Among Swedish Lieder composers, Karkoff occupies a unique position. 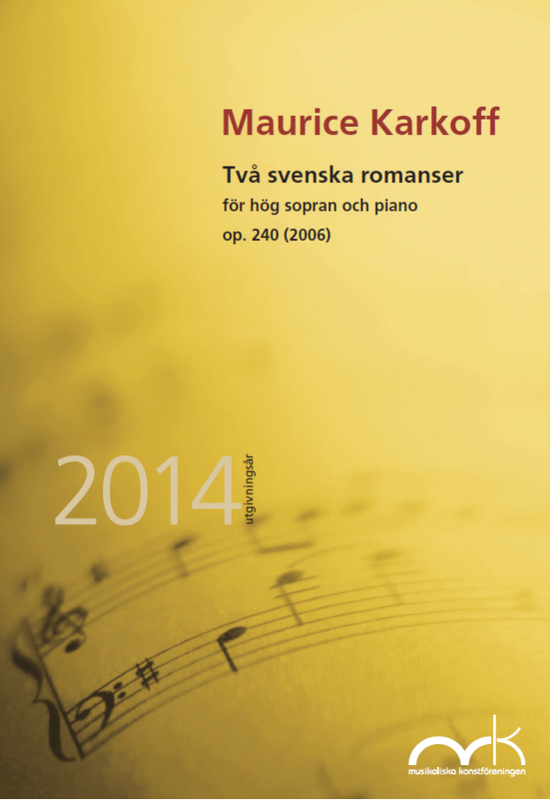 Previously, the Swedish Art Music Society has published "Ten Japanese songs" and "Nine Chinese songs" and now presents "Two Swedish romances for high soprano and piano, Op. 240 ". When the composer identifies himself in the mental world that Elsa Grave, Paul Celan, Gunnar Ekelöf and Tomas Tranströmer express in their poems, a rare association between words and music results. Through his intuitive sensitivity to the voice's range of expressions and the piano part's both cleverly soloist and accompanist role, the result is exquisite works of art.